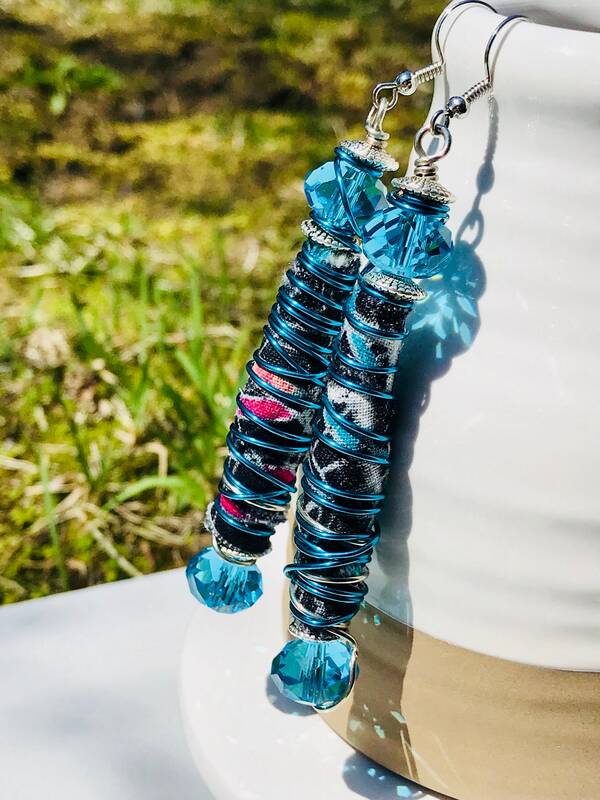 These are eclectic earrings made with a polymer clay base and wrapped in 100% cotton fabric, blue copper wire, blue rondelle crystal beads and silver accents. 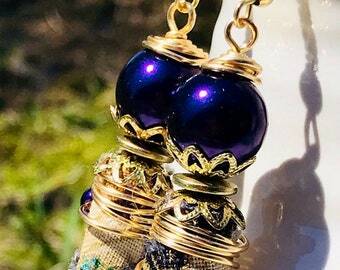 Beads: Polymer clay base/ wrapped in 100% cotton fabric, blue copper wire, blue rondelle crystal beads and silver accents. Another purchase. 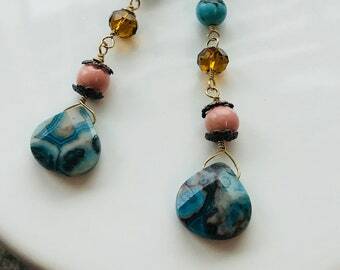 Fun earrings... Looking forward to what this shop has to offer in the future. Shipped promptly. 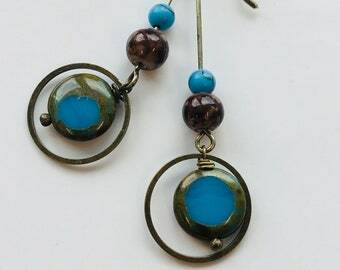 Love these fun earrings. Seller great to work with! Absolutely love these earrings. Delivered super fast. Very happy with my purchase. This were lovely and shipped on time. They were however much too large for me. I keep trying to wear them even tho'. Boho Dangle earrings, fabric earrings, wire-wrapped earrings, Handmade Earrings, Boho Earrings, pink earrings, dangle and drop earrings. 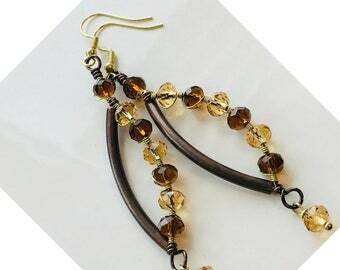 Payment by credit card is the only method of payment (through both Etsy and PayPal). PinkIce Jewels excepts exchanges only. Id you are not happy with your purchase please contact me as soon as possible. Upon exchange customer pays for shipment on exchange item. We occasionally offer classes. Class fees can be transferred to any other class (as well as the *kit for that class) only once. If for any reason that the second class is unattended then the class fee will be forfeited. *The kit for the transferred class can be exchange and if the cost is higher than previous kit the difference will be due. All shipments are sent USPS with tracking. Orders of $50 or more will include insurance. Orders of an $100 or more will ship for free. Please use the coupon code FREESHIP100. Orders are processed and shipped on Monday, Wednesday and Friday. Alchemy, custom orders, consignments and wholesale are all welcomed. Please send convo for details and arrangements.